Following in the foot steps of velo-friendly streets like Montrose and Shaw, Fermanagh Avenue in downtown Toronto's west end will soon have a contraflow bicycle lane. 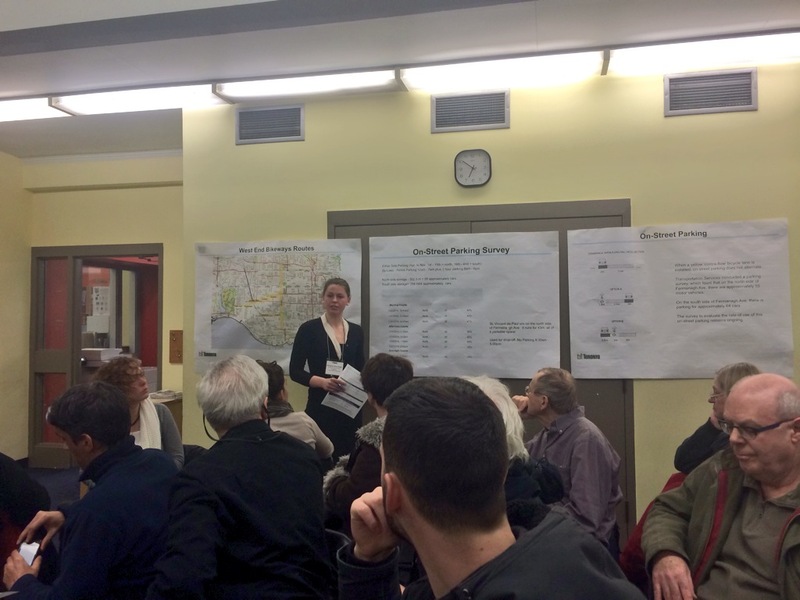 On Wednesday night (February 5), about 30 residents braved the slushy streets to attend a meeting at High Park Library, examining design options for the new contraflow lane: the first to be installed in the Parkdale-High Park neighbourhood. Ward 14 Councillor Gord Perks helped city staff unveil two proposed designs. Fermanagh was approved for a contraflow bicycle lane back in 2009 as part of the West End Bikeways plan. A contraflow bicycle lane is a single bike lane on a one-way street that provides a space for cyclists to travel in the direction opposite to motorized traffic. Contraflows help create continuous routes for cyclists through neighbourhoods with a large number of one-way streets. The West End Bikeways plan was developed through public consultations discussing how to improve neighbourhood connectivity for cyclists in the city's lower west end. Despite having one of the highest cycling mode shares in the city, Ward 14 is woefully devoid of bike lanes. As Councillor Perks pointed out at the meeting, part of the reason is geography: the presence of multiple rail lines limits east-west access to Parkdale and Roncesvalles to major arterial roads. Even if you've never heard of Fermanagh, if you frequent High Park there's a good chance you've cycled on it. The east gate of High Park exits onto High Park Blvd., a two-way east-west street used by many cyclists and pedestrians to access the city's largest park (outside of the islands). At Roncevalles, High Park Blvd. changes to Fermanagh Ave. and becomes a one-way street, preventing cyclists from continuing eastwards. 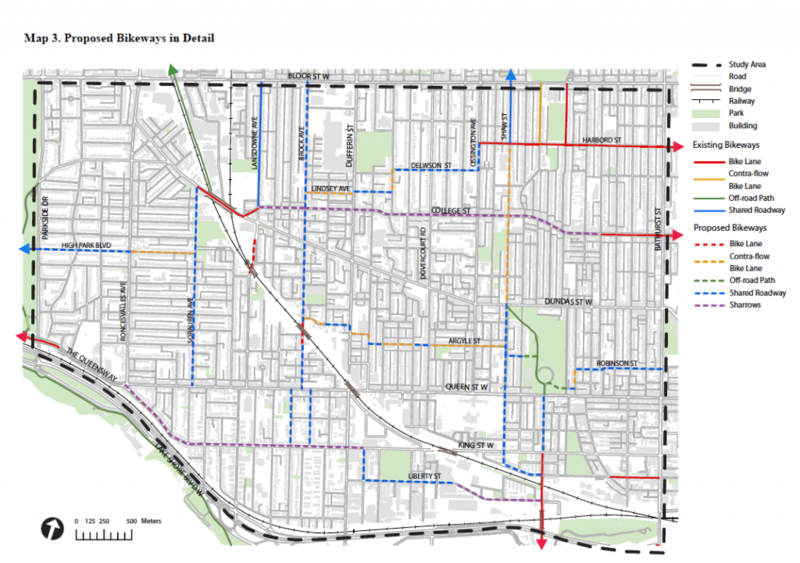 The West End Bikeways Plan identified Fermanagh as part of an east-west “High Park-to-Harbord connector” route that would provide cyclists with an alternative to busier roads. In fact, Fermanagh is the only fully signalled intersection at Roncesvalles between Howard Park (which spits you out on Dundas) and Queen, so it's a pretty crucial street for connecting cyclists to the park. Right now, in order to continue east past Roncesvalles, you're forced to merge with heavy traffic, cross two sets of streetcar tracks, and make a left turn at an uncontrolled intersection. This can be downright daunting, which leads to many cyclists riding against traffic on Fermanagh. The city's movement on contraflow bike lanes over the past year has been encouraging. Shaw was installed last year (even if the yellow stripe faded fast), and Fermanagh is next up, with a public meeting to be held this spring concerning Argyle and Dixon. Contraflows are a great idea – a reconfiguration of space that minimally inconveniences motorists, because it doesn't reduce car lanes and or eliminate on-street parking. But we shouldn't lose sight of the fact that contraflow bike lanes are only a partial solution to the lack of an adequate cycling network in Toronto. After all, Fermanagh is only 400 metres long. Without investment in cycling infrastructure on major arteries our cycling network will remain fragmented. Photo above by Joey Schwartz, of some of the fine folk who made it out to the public meeting with City staffer Chris Bouchard at the presentation board. Did you know Ward 14 has a cycling advocacy group? If you want to hear what Cycle Toronto Ward 14 is up to, join our Facebook group “Cycle Toronto Ward 14 Advocacy Group” or sign up for our e-mail updates at http://cycleto.ca/ward/14.